Caption slip reads: "Photographer: Olmo. Reporter: Ostler. Assignment: Shrine Circus, Shrine Auditorium. 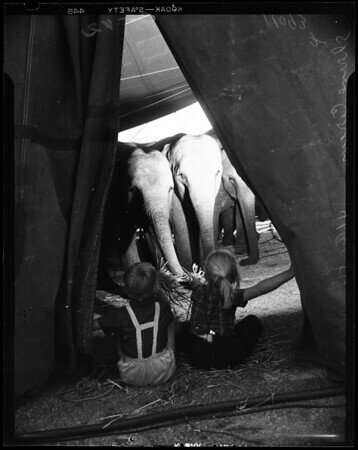 43-42: Two youngsters feeding elephants through flaps of tent. 44: Donna Ward, 5, reaches for ice cream bar of brother, Bradley, 6, but 'Betty-Belle' circus Indian elephant has other ideas. 45/46/47: Anita Claire Bokvist, 17 mon. stands on father's hand, Curt Bokvist".